Choosing to do the 21 Day Fix after having a baby could be a great way to spring back into shape and get rid of the extra pregnancy pounds. Now that you’ve just given birth to a beautiful new baby, there are some things you will want to take into consideration when working out with the Fix. This is what we’ll cover in this post. Get Your Doctor’s Permission to Exercise First! I cannot stress this one enough when talking with new moms. Always, always, always get the okay from your obstetrician or health care provider before you start the 21 Day Fix post pregnancy. This is usually around the six week mark and will depend on how active you were during pregnancy, how you gave birth and how you’re recovering. Exercising after pregnancy can be beneficial by promoting better sleep, improving your mood, relieving stress and toning up your abdominal region, but doing too much too soon can do more harm than good. You may need to start off more slowly. There is no set time as to when you can start the 21 Day Fix after pregnancy, since everyone’s situation and recovery rates are unique. The best time is when after you’ve been given the okay by your doctor and you’re ready. Things won’t be entirely back to normal for long after your six-week follow-up appointment, so really listen to your body. Ease back into things to make sure you don’t injure yourself. Active Pregnancy: If you stayed active during your pregnancy and/or were active before pregnancy, then getting your figure back after pregnancy will be a lot easier. You’ll still be in shape, and you won’t have a lot of extra weight to lose – congratulations! It also means you will likely be able to start the 21 Day Fix sooner than six weeks postpartum with your doctor’s approval. You can likely do the program almost full speed depending on how you feel, but may be told to be careful with certain moves by your doctor. Moves like burpees, moves that stretch your abdominals and certain ab exercises may be off limits if you’re not entirely healed. Less Active Pregnancy: If you did not or were not able to exercise before or during pregnancy, then you will definitely want to wait until your six-week follow-up appointment to get your doctor’s approval to do the 21 Day Fix. Or they will tell you to wait until you’re healed to do the Fix. Instead, your doctor may give you the okay for walking, pelvic floor exercises or postnatal yoga. 21 Day Fix Post C-Section or Complicated Labor/Delivery: If you had a cesarean delivery or experienced labor complications, you will need to ease into exercise more gradually and make sure your middle is healing properly before jumping into the 21 Day Fix. Again, get your doctor’s advice for when is the right time for you, since we are all individual, and it will all depend on how you’re recovering. During the period until my four-week follow-up, I stuck to pelvic floor exercises, outdoor walks, postnatal yoga and gentle abdominal exercises like breathing and bridges to help begin to strengthen and heal. I avoided twisting of my abdomen, planks and crunches. Do any moves cause extreme discomfort? Are you leaking urine at all (or worse!)? Do you have bulging or peaking anywhere on your abdomen when doing abdominal moves? Do you feel unstable in your core, almost like your insides might fall out? Are you experiencing any straining or sharp pains? If you experience any of the above, you will definitely want to avoid the following exercises and stop doing whatever move is causing it: burpees, lifting heavy weights, high impact exercises that involve jumping, running, push-ups, as well as abdominal exercises such as planks, crunches, sit-ups, or leg lifts. Try following the modifier or walking it out. 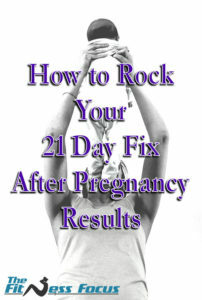 Don’t be afraid to modify the 21 Day Fix after pregnancy! My advice is to follow the modifier during high impact moves and do pelvic floor exercises as part of your morning routine until you feel normal down there. I went through an awesome labor (let’s just say I was still smiling and cracking jokes at 10cm dilated! ), but ended up having a cesarean delivery. One thing to remember is that you underwent major abdominal surgery. This means things are pretty messed up down there. You don’t just have a scar on the outside. You have several layers they cut through. I know I had some serious worries after giving birth if they put everything back where it belongs, lol. And the pain in the weeks following was more than I expected. Wait for your doctor’s okay and take it easy for as long as you need. Your doctor may give you the okay to gently work out after having your baby, but if you’re not feeling up to it physically, don’t push yourself. You can even think of your first six weeks post-delivery as recovery time from surgery. Go for daily walks, get fresh air, do pelvic floor exercises, meditate and practice postnatal yoga. The good news is that the 21 Day Fix diet is the perfect postpartum option, breastfeeding or not. That’s because the Fix is full of healthy nutritious foods that will benefit your rapidly growing baby and help you feel your best. You just need to think about how much weight you’re trying to lose and how realistic you’re being about your weight loss timeframe. If you’re breastfeeding while following the 21 Day Fix diet plan, you must feed yourself enough calories to supply your baby with an ample milk supply. Your baby’s health and growth should always be your first priority – not getting rid of the belly pooch! We will talk about exact amounts below. When following the 21 Day Fix post baby, how many calories (or containers) you consume each day will all depend on whether or not you are breastfeeding. If you ARE NOT breastfeeding: Stick to the regular amount of calories you would consume on the Fix as if you didn’t just have a baby, using your current weight. You can find out how to calculate your 21 day fix calorie and container level here. Eat 1800-2200 calories. This is the amount most healthy women take in to ensure an abundant milk supply. You should never feel hungry!!! Your baby’s health is your top priority! Lose too much, and you risk not making enough milk for your baby. A calorie range that worked well for me 2100-2300 daily. This led to gradual and sustainable weight loss that has not affected my milk supply – even with a very hungry little boy! Double check with your doctor for a calorie range that works for you, since they know you and your body best. You are a new momma, so try to enjoy this special time with your new miracle! Don’t worry about getting your figure back in an instant. It took nine months to grow your beautiful baby, so don’t stress out when it doesn’t all go away overnight.